View of the gold mines near Woodenbridge in County Wicklow, Ireland. In 1795 it became known that some of the rivers in this region carried quantities of alluvial gold and in fact gold nuggets were found by local people. This caused the only indigenous gold rush in Ireland. The most profitable location for gold mining was below Ballinagore Bridge at the 'Red Hole'. 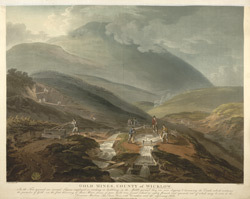 The activities of the local people who were finding the gold was deemed a threat to political stability and consequently their panning and mining for gold was controlled by the Kildare Milita. Despite over 900 oz of gold being discovered, no bedrock source of gold was ever found. The workers in the foreground of this picture are buddeling, and those in the middle ground are digging and barrowing the earth. The artist Thomas Sautelle Roberts noted that when the gold nuggets were first found they were valued at more than £80 and were taken to the Levarian Museum.